Duane and his deformed brother Belial find refuge in the house of Granny Ruth, who will shelter him in her mansion alongside a dozen of other deformed freaks. Most often, when a sequel is done by the same director as the original, it is bound to be good (The Bride of Frankenstein, Evil Dead 2, House of 1000 Corpses) because it allows the director to further expand on his original idea of the movie, and not just repeat it. However here, I must say I wasn’t expecting this much awesomeness. The movie picks up the story where the first one left it, but instead of just continuing with the same scenario and just more killings, it brings into the story a whole new dimension in the story, introducing a whole community of awesome looking monsters. These latex-made monsters come in all shapes and sizes, forming what is one of the greatest monster bestiary in horror history, alongside Clive Barker’s NightBreed (released the same year). Some of the scenes are memorable, and when a photograph manages to make it into the monster’s filled attic… it is a proper hellish scene that I still have trouble getting out of my mind. The only regrettable aspect for me was the monster itself (Belial) who is different from the first one, and unfortunately looks less scary. 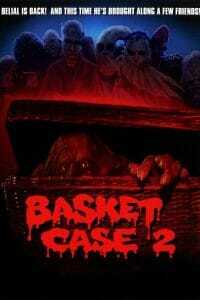 In conclusion, Basket Case is a very impressive sequel, improved on every level. It is weirder, it is campier, and it has a hell of a lot more monsters in it. 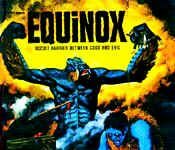 The movie is completely far out and never takes itself seriously, like an on-acid ride into a haunted house!